American or English rosewood & walnut with matched walnut veneer top. Cabriole legs terminating in pad feet. Drawers of pine secondary wood. Size: 28 1/2" tall. 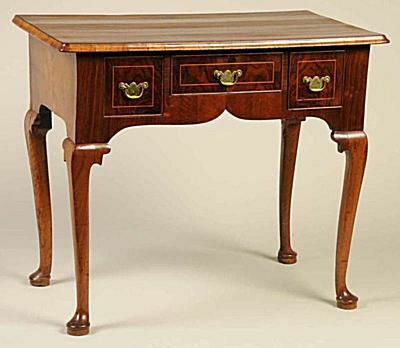 Molded edge top over single drawer and delicate cabriole legs terminating in pad feet. Provenance: Douglas C. Whitesell, Middleburg, Va. Size: 28 3/8" tall. Size: 25 1/2" tall, 15 3/4" in diameter across the top. American or English settee with mold carved arms, cabriole legs, shell carved knees and pad feet. Provenance: Matthews & Shank, Shepherdstown, WV. 72 3/4" long. Molded top with fan carving, scalloped skirt and whale tail drops supported by cabriole legs terminating in pad feet. Replaced brasses. Size: 29 5/8" tall. Mahogany with yellow pine secondary wood. Molded edge top and tall delicate cabriole legs terminating in pad feet. Age crack to top. Size: 27 1/2" tall. One board tilt top supported by a tripod base with cabriole legs terminating in slipper feet. Age crack with butterflies added to top. Size: 28 3/4" tall. Likely of Connecticut origin. Carved skirt with acorn drops supported by cabriole legs terminating in pad feet. Refinished. Brasses replaced. Size: 76" tall. Drawers rest on a frame with scalloped skirt with short cabriole legs terminating in slipper feet. Replaced brasses. Base restored. Size: 57 5/8" tall. Inscribed "Mr. Hampton Young Coller Master-Southold". Provenance: Found at Southold Plantation, Virginia. Oval two-board top over square skirt supported by tapering legs terminating in pad feet. Refinished. Provenance: Sumpter Priddy, Alexandria, Va. Size: 28" tall. Can You Identify Queen Anne Style Furniture?